Gardeners, we know how you cherish your tomatoes. You'll adore this tee just as much. The graphic shows your favorite accessories: watering can, butterflies, a trowel and tomatoes. Many gardeners judge themselves on the beauty and bounty of their tomatoes so they're the perfect symbol of garden glory. It also happens that their name could be read "to my toes," making them perfect to indicate the top-to-toe delight of working the soil on a sunny day. 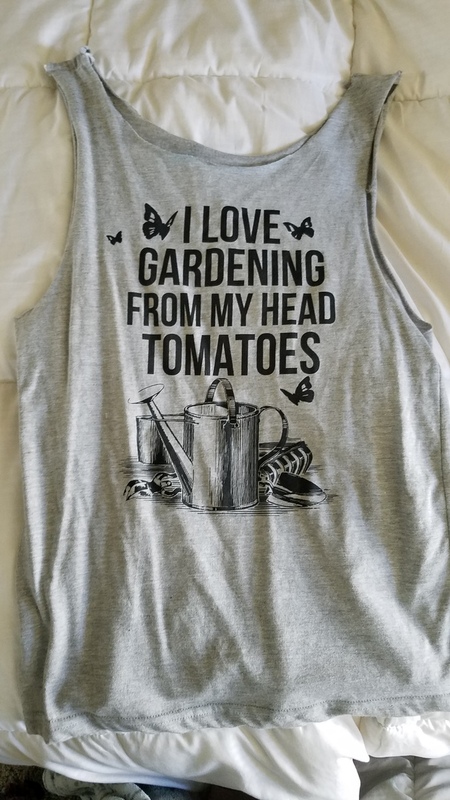 In white or gray this tee will keep you feeling breezy as you walk along your tomato stakes. Wear it with a straw hat and a bag of fertilizer. Bought it for a gift. The fit was smaller than I expected, though the quality of the item was very good. The women’s teeshirt that I ordered is a very nice quality. It runs a little small. I ABSOLUTELY LOVE MY TSHIRT AND WILL BE PURCHASING MORE FOR FRIENDS WHEN FUNDS ALLOW. THANK YOU! I gifted this to my daughter in law. She loved it. I did too. Nice quality.